Phase I of flood restoration work is complete along the St. Vrain Creek between US 36 and Airport Road. This section is known as Reach 3 and Phase I repaired the “Breaches.” Phase II will begin in 2019. Reach 3 is located east of Lyons and west of Longmont. 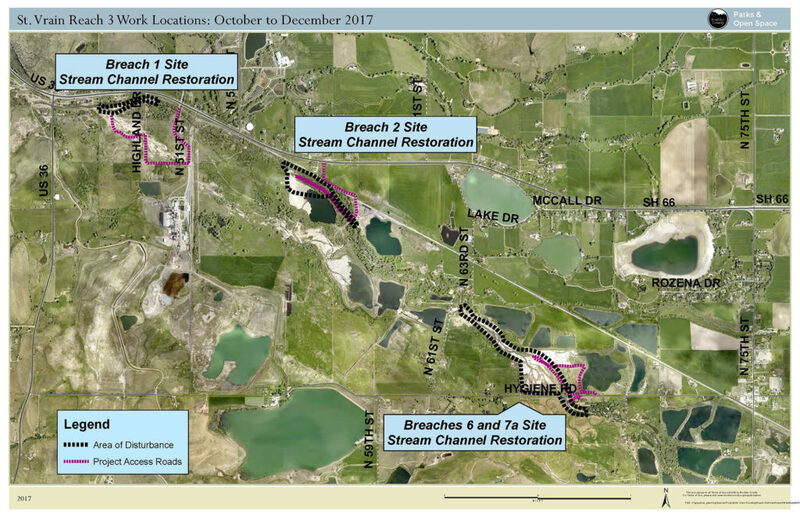 The approximate project boundaries are US-36 to the west, Ute Highway (SH-66) to the north, N. 75th St. to the east, and Hygiene Road to the south. The area was severely damaged by the September 2013 floods due to many streambank breaches and concentrated flow in areas of the floodplain. The project was completed on May 25, 2018. The county will monitor and manage the project for a minimum of three years post-construction. The goal of the project was to restore and improve the channel and surrounding floodplain to protect life and property and provide a safe, natural, resilient, functioning, and ecologically rich habitat utilizing natural system principles. The project expedited recovery from the 2013 floods and made the area more resilient in future flood events. Funding for this project was provided by the Natural Resources Conservation Service’s Emergency Watershed Protection program, the State of Colorado through the Colorado Water Conservation Board, and Boulder County. Boulder County Parks & Open Space, along with the St. Vrain Creek Coalition, neighbors, and other stakeholders, collaborated on post-flood restoration planning for Reach 3 in the St. Vrain Creek Watershed Master Plan. Parks & Open Space began planning and design work on Reach 3 of the Saint Vrain Creek in 2016. The planning phase, funded by the U.S. Department of Housing and Urban Development’s Community Development Block Grant for Disaster Relief (CDBG-DR) was a collaborative effort with stakeholders throughout the Saint Vrain Creek watershed. Through a series of public meetings with neighbors, the City of Longmont, the Saint Vrain Creek Coalition, and other stakeholders, we developed a comprehensive plan and a 30% design. We then sought and received preliminary approval for a grant from the Emergency Watershed Protection (EWP) Program from the Natural Resource Conservation Service (NRCS) as administered by the Colorado Water Conservation Board (CWCB). Utilizing this funding source, the 80% design for Reach 3 was completed in June 2017. The project team presented the final 30% design of the stream restoration. The team addressed concerns, provide responses, and make appropriate changes as necessary. The project team presented the preferred alternative and addressed concerns, provided responses, and is considering appropriate changes as necessary. The project team presented draft alternatives and conducted a site visit with the public. The meeting was attended by members of the public as well as members of the Saint Vrain Creek Coalition. On the following evening, a shortened version of the presentation was presented to the Saint Vrain Creek Coalition Advisory Committee. Parks & Open Space and it’s consultant, Engineering Analytics, provided a brief presentation on the project approach, including a general outline of the engineering and restoration design process and the project goals and objectives. The team led a discussion gathering public input and concerns that will inform the design of the restoration project.